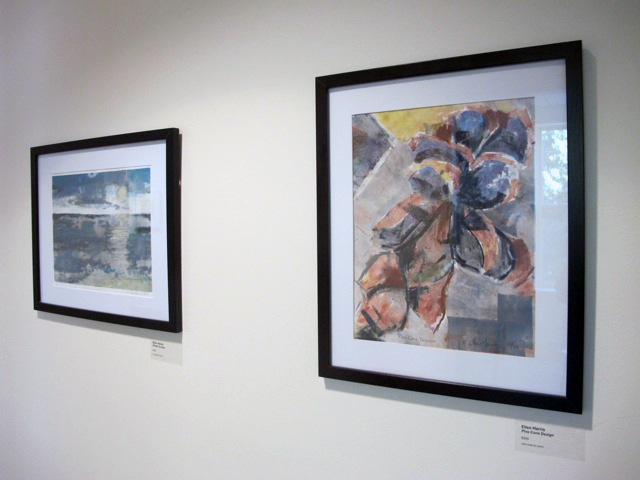 It was back in 2007 that Bob and Elaine Cunniff organized the Coastal Printmakers and now our most recent Coastal Printmaker Invitational Exhibit has over 60 original prints all hanging at the South Shore Conservatory in Hingham, MA. This is one of the exhibit spaces managed by the South Shore Art Center. Within the exhibit are an array of creative and thought provoking pieces. Several of the prints are monotypes which lend themselves to a painterly style that merges abstraction and realism. While hanging the exhibit I was able to sneak in a couple of shots. 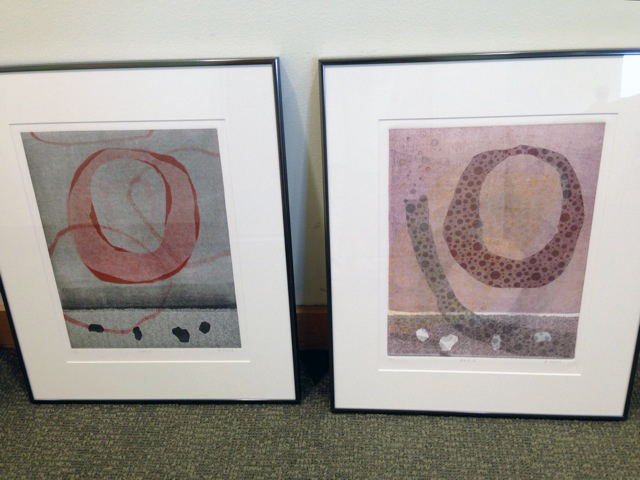 These three monotypes by Trish Berube are gorgeously organic with a looseness of texture and incredible details. Joan Hausrath has included some of her collographs that have a primitive and tribal theme with a skill of printmaking that lends itself to her subject matter. 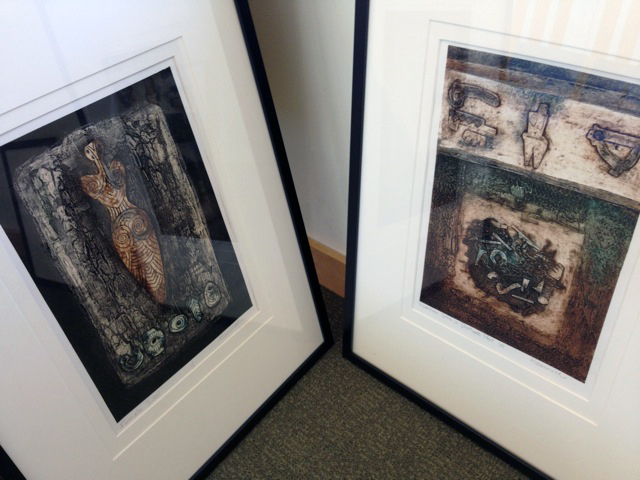 Joan is offering a Collograph and Monoprint Workshop this July at the South Shore Art Center in Cohasset, MA. I’m a fan! 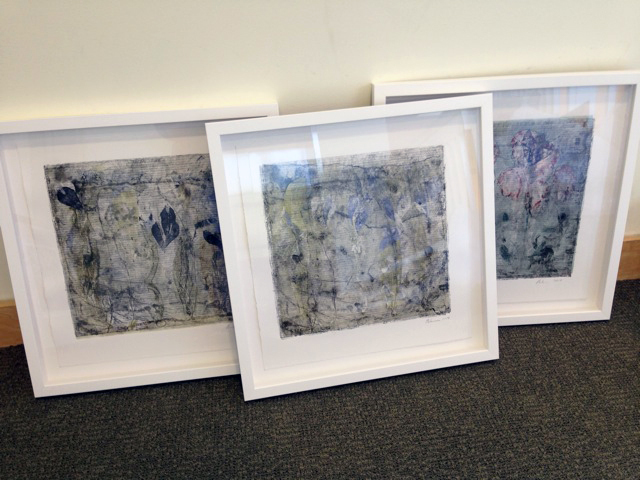 Monotypes on paper with fabric imprint by Roxane Hynek. These intriguing pieces by Roxane Hynek are mesmerizing and beautiful in their simplicity. The wall of Black & White prints. 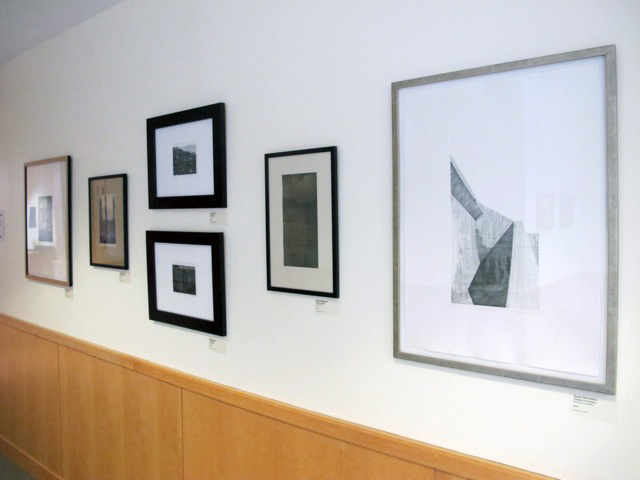 In the downstairs hallway the Coastal Printmakers Exhibit continues with a wall filled with black and white prints by accomplished printmakers Susan Denniston, Michele Meister, Amy Geyer and more. 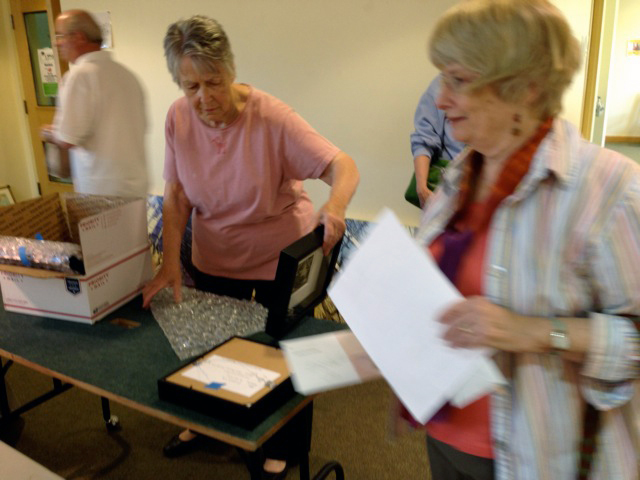 Larry Guilmette, Esther Maschio and Joan Drescher working on hanging the exhibit. Thanks to all the Coastal Printmakers, the So. Shore Art Center, the So. Shore Conservatory and all our volunteers that made this exhibit possible. This is a printmaking exhibit not to be missed with several fine art prints that are the efforts of local artists. All of the pieces are originals and available for purchase through the So. Shore Art Center. The best way to appreciate art is to see it in person. This exhibit runs through September 30th, 2014 and is located at the So. Shore Conservatory at 1 Conservatory Drive in Hingham, MA 02043. 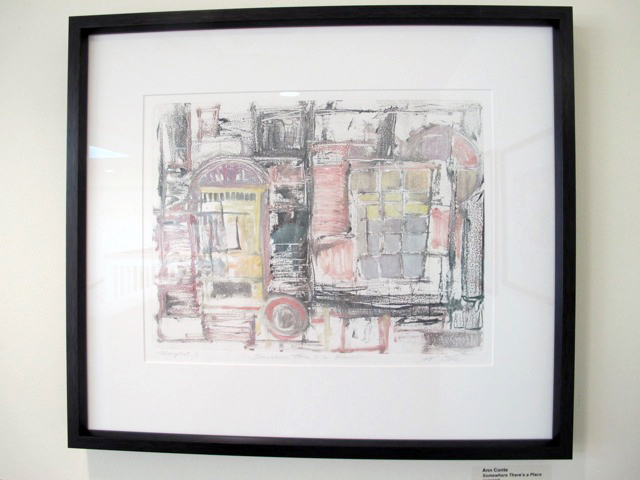 You are currently reading Coastal Printmaker Invitational Exhibit at donna ingemanson studio.